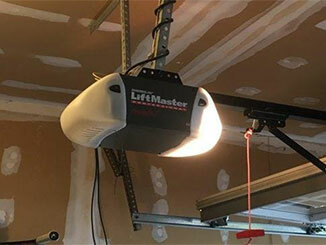 The opener is the most complex component of your garage door system. It must work perfectly with every other part of the door – if it doesn't, there are plenty of issues that can develop. From a drive gear in need of lubrication to a faulty circuit board, our technicians have the skill and experience to quickly diagnose and repair any opener related problem. If our team discovers a broken part or a faulty component we can often swap it out on the spot, getting your door back to working order as quickly as possible. Many of the common issues that openers develop are due to a lack of maintenance. It’s essential to make sure that all the moving parts are kept properly lubricated and that the safety sensors are properly adjusted. This helps to prevent the cost and hassle of dealing with a malfunctioning opener. We strongly recommend scheduling regular appointments with our team of technicians. It can be difficult to work out exactly which opener is right for your garage. Our technicians are always happy to provide guidance when you’re choosing a new system, and will ensure you have all the information you need to make an informed decision. Whether you prefer an affordable and reliable chain-drive or a smooth and silent belt-drive, our team is on hand to help. Our team also provides high quality professional installation services for new opener units - we can supply these new systems for you and look after the installation process from start to finish. You can also feel safe in the knowledge that we only work with brands that we know and trust, such as Chamberlain, Genie and LiftMaster to bring you the best model for your home. If you need a repair team you can count on to get the job done, contact our team today at Garage Door Repair Big Lake to arrange an appointment.